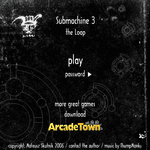 Submachine 3: The Loop (or Sub3) is the third installation of the Submachine series, though it may be fourth chronologically. It takes an entirely different path from the rest of the series, does not feature more than a single background (reused in an endless number of rooms), only features two items that can be picked up, and focuses solely on puzzles with no exploring linking them together. It is quite loosely tied to the other games but a new area of this structure is revisited in Submachine 4: The Lab where it is called the "Looping Traps". Source: Submachine Wiki, "http://submachine.wikia.com/wiki/Submachine_3:_The_Loop", available under the CC-BY-SA License.